Elbow displasia or ED is the term used to describe arthritis or DJD of the elbow, causd by growth abnormalities or incongruence of the elbow joint. Bad elbows frequently result in young dogs having to euthanized as diseased elbows are less easy to treat than bad hips and very painful. Moreover, research has shown that ED is highly heritable. If a dog has ED, a significant proportion of its offspring are also likely to have ED. Elbows are graded 0-3, with O being clear, 1 mild ED , 2 moderate ED and 3 severe ED. Please see here for more information on ED and elbow scoring. A comprehensive discussion of ED can be found here. All breeding dogs should have had their elbows x-rayed and submitted to a recognised grading scheme. In the UK, this is the BVA (NB there is a discount for scoring hips and elbows at the same time). Some older dogs will not have been graded but should have a certificate from a veterinarian stating that the elbows have been x-rayed at 12 moths or older and found to be clear. 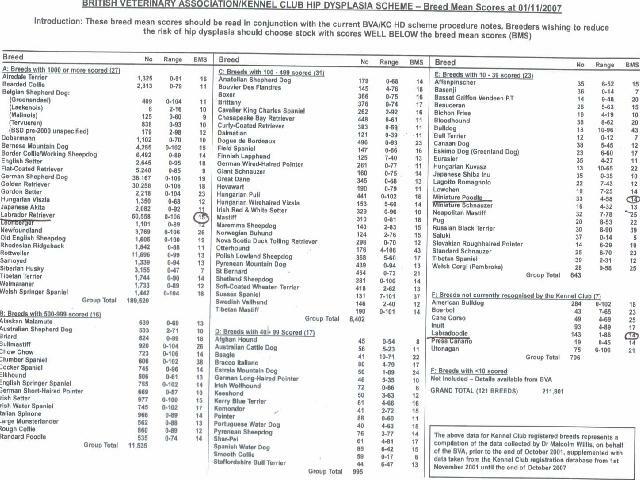 It is probably safest to assume that dogs which have only had their x-rays checked by a vet rather than officially graded may be 1:1 as a vet may not pick up the slight chnges which constitute mild ED. The BVA recommend only breeding from dogs with 0:0 or 1:1 elbows. Unfortunately, at this time there is no treatment or cure for PRA. If your dog is affected, you may find it helpful to read about other owners’ experiences living with blind dogs. The OptiGen prcd test is done on a small sample of blood from the dog. The test analyzes the specific DNA mutation causing prcd-PRA. The OptiGen test detects the mutant, abnormal gene copy and the normal gene copy. The result of the test is a genotype and allows separation of dogs into three groups: Normal/Clear (homozygous normal), Carrier (heterozygous) and Affected (homozygous mutant).